For 20 years, the Lackawanna Heritage Valley has made a difference. it has worked with a variety of partners to tell the region’s story, revitalize local communities, and to build a major rail-trail. LHV invites you to join these efforts as a member. Your contribution will be used to preserve historic sites, conserve cultural and ethnic traditions, support public programming, fund educational initiatives for students, and help continue the 70 mile Lackawanna River Heritage Trail. Become a “Heritage Partner” today! Do you love the region, its trails, and the great outdoors? Joining Ambassadors in Action is a wonderful way to use your talents, to develop skills, to meet new people, and to give back to the community.The Lackawanna Heritage Valley National and State Heritage Area (LHV) and Heritage Valley Partners (HVP) invite you to join “Ambassadors in Action,” the Heritage Valley’s hands-on volunteer corps! Under the sponsorship of HVP volunteers are needed to help with trail clean-ups, heritage events, office support, and more! There are opportunities for everyone. All tasks offer flexibility in scheduling and consideration of any physical limitations. Download one of the above forms and fill it out, either on your computer or by hand. Then, return it to us via mail, fax, or email. The LHV has a full schedule of events throughout the year. The list of ways to help is always growing. After you submit your information, LHV will call you to learn more about your interests and to answer your questions. We host a number of Special Events, Community and Economic Developmen, Office and Clerical Assistance, Trail Tenders, Adopt-a-Trail and more. Heritage Explorer Train, Santa Train, Ambassador Tours, and partner events! Coordination of special events, database entry, mailings, and office support. Maintain and enhance the natural beauty of the Lackawanna River Heritage Trail. 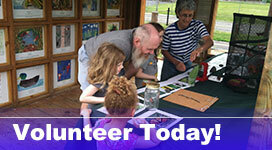 Become an integral component in the beautification of the Lackawanna River Heritage Trail.